When you surf the web, do you ever wish to browse your favorite topics by clicking randomly and aimlessly? Do you sometimes wish to find more sites of your favorite subjects but have no idea what is actually worth looking at and wish for rates by others that share your interests? StumbleUpon is a website viewer that shows you popular sites of different genres and topics that other people vote on so you can more likely find a site you would like. 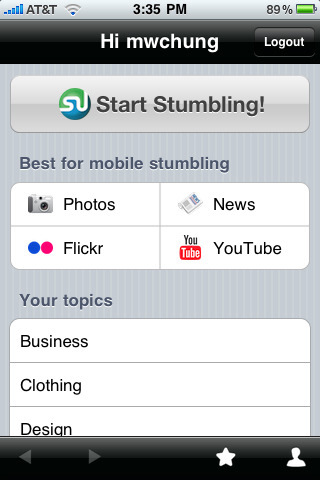 StumbleUpon is available for the iPhone, iPod touch, and iPad and is a free app. I’ve never used StumbleUpon in its original form, so much of this app was a mystery to me prior to using it. First thing you have to do is sign up. It only takes a minute, so it wasn’t that bad. You choose what topics you like, and you are good to go. Stumbling gives you several options for web viewing including viewing it right from the app or opening it on your Safari browser. You can like or dislike websites so they don’t show up for you again and you can warn others about lame sites. I had a few issues with the app however. I couldn’t edit my interests at all via the app. At first, I wanted to start off with just one to get a feel for how this app worked, so I chose “Paranormal” to check out some creepy stuff. Afterwards, there was no way for me to add anything else like Health or Sports or anything else. There is no ‘forgot your password?’ link on the app itself. I hate to admit it, but after a day of use, I forgot what my password was for my account. What about parental content control? Nothing in the app will help you. It was then that went to my computer and went to the official site at www.stumbleupon.com to actually see the settings. As it turns out, the password changer, interest changer, and profile editers were all there on the site. I really wish this was all easily manageable without having to exit the app, but at least you can change the info right from your Safari app. The stumbling feels pretty good but I feel like if I touch one of my topics like Business, it should send me to a random business site, but the app itself will always stay on full list random. A minor issue, but it makes me wonder why I can even touch the topics as a button. Overall, this StumbleUpon app works well. It’s free, and has in fact introduced me to a few new sites. Overall, I just wished for a better and more customizable interface right from the app itself, but overall, it’s a darn good app for web surfing. 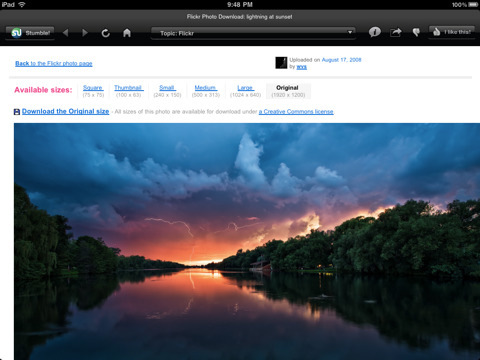 An iPad version of StumbleUpon is also available, although you have to download them separately. AppSafari review of StumbleUpon was written by Joseph Ho on September 1st, 2010 and categorized under App Store, Fun, Productivity, Utilities. Page viewed 5875 times, 1 so far today. Need help on using these apps? Please read the Help Page. I’ve also found that on the iPad, the StumbleUpon app is very similar to just their regular website, so its advantages are minimal. Moreover, any adult content you may have okayed in your personalized settings on their web site remains unviewable on the iPad. This app gives great simple access to the same functions you expect from Stumbleupon. Great to see they have an android version too.